The dead tell no tales, which is why history oftentimes omits some very interesting details. I did a little digging for dirt during a recent meeting with well-known Archeologist and Egyptologist, Kara Cooney, author of The Woman Who Would Be King, about the rise to power of the Egyptian Pharaoh-Queen Hatshepsut. It’s a great read, but somehow we strayed from the book to the topic of tomb plundering, which was even more fascinating. Cooney, a 6-foot tall, modern Lara Croft-type figure, spends her time amidst the mummies while specializing in ancient coffin identification. You would think it wouldn’t be a problem figuring out who is sealed up in which coffin with all the sepulchre inscriptions and markings, but it appears royal mummies were often removed from their original nesting coffins, which were multiple coffins within coffins much like those Russian Matryoshka dolls. 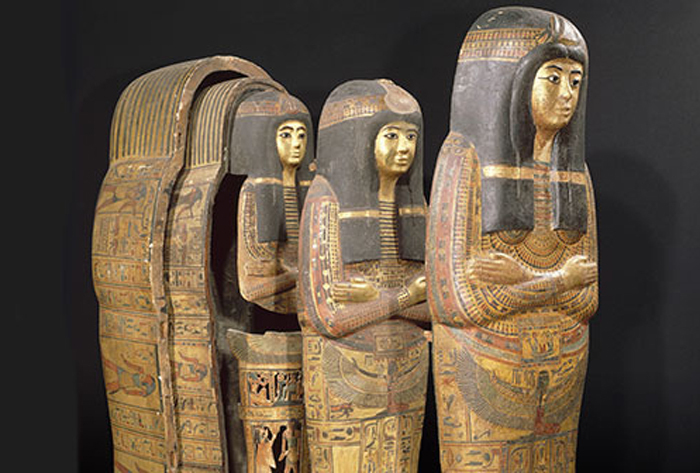 Some mummies were buried in three to as many as eight internal coffins (as was King Tutankhamen). This multiple coffin practice was part of the process that linked them to their ancestors. But when tombs were plundered, the mummies were often tossed aside and the coffins were re-sold or recycled for other mummies. Who was buried where and in which coffin became a dilemma for later identification purposes. This is where Cooney’s expertise is often called in. Tomb robbery has been going on since the earliest of times. Old Kingdom inscriptions contained warnings that robbers would be judged by the gods in the hereafter. Severe punishments awaited them in their current life as well, if a curse didn’t get them first. Sometimes safeguards were built-in to thwart the robber. The burial chamber in the tomb of Senwosret at Lisht was protected by a series of stone slabs, the first of which, once lowered, could not be forced upwards again because metal or wooden bolts were released from holes in the lateral grooves in the slab, effectively locking it. But there were times when undertakers and cemetery guardians took advantage and stole precious belongings of the royals and elite during the very time of burial. A tomb could later be found to have entrance blockings still intact, yet the valuables had already been removed from the body. Objects and jewelry of gold, precious stones, alabaster and faience, which had been placed within the tombs for the use of the kings in the afterlife, as well as gold masks, would all be stripped off. Even large stone sarcophagi could not always prevent theft, since the thieves would lever off the lids or even tunnel through the sides or floors of the sarcophagi. Today only a handful of bodies remain in their tombs, and even fewer are still as they were when interred. But was this all the work of common thieves, or was there a higher order at work in the looting process? Cooney says much of the more extensive looting was actually done by the High Priests of Amun, in cooperation with the government treasury, in order to save the Egyptian economy. After the death of Ramses III, during the New Kingdom’s Twentieth Dynasty, Egypt fell apart due to constant foreign invasions and the heavy cost of war. Drought may have also played a factor towards economic collapse. The Egyptian treasury was close to empty. To keep the government going it called for drastic measures. Gold was needed, and needed fast. Those in power knew where the gold was hidden and which pharaoh’s tombs had an abundance. The high priests would open the tombs and, unlike the common tomb robbers, they would carefully unwrap the bodies and strip them of the golden pectoral hawks and scarabs which had been placed on their body for protection. Rings, jewelry, furniture, and anything else made of gold, which could replenish an empty treasury, was confiscated. The priests would then see to it that the tapes, the outer sheet, and the Osiris sheets were neatly and carefully folded on the bodies and stitched up the back. When the mummies found in later years were unwrapped, the black resin marks from where the gold necklaces had once been placed, could still be seen. The priests back then were an unholy lot. They did not take vows of poverty nor chastity. Power and influence went hand and hand with accumulated wealth, and because of it they were a powerful force to be reckoned with throughout Ancient Egypt. Some might liken them to the Vatican today, which wields substantial political influence. It’s treasury contains more wealth than many countries combined. Even after all these centuries, some things still have not changed. It’s still all about who has and controls the most Gold. British Egyptologist Nicholas Reeves, director of the Amarna Royal Tombs Project, claimed last year that the tomb of King Tutankhamun holds a hidden doorway that leads to the tomb of Queen Nefertiti, the stepmother of Tutankhamun. Additional scans by radar technologist Hirokatsu Watanabe seem to also confirm there are two hidden chambers based on structural anomalies. Yet, Live Science, recently released the news that National Geographic Society’s radar scans of King Tutankhamun’s tomb show no hidden chambers behind the walls. Dean Goodman, a geophysicist at GPR-Slice software, which conducted the scans for National Geographic and issued the definitive word, said he was barred from commenting on his findings. Disappointment reigned throughout the Egyptology world except, perhaps, for one man—Dr. Zahi Hawass. 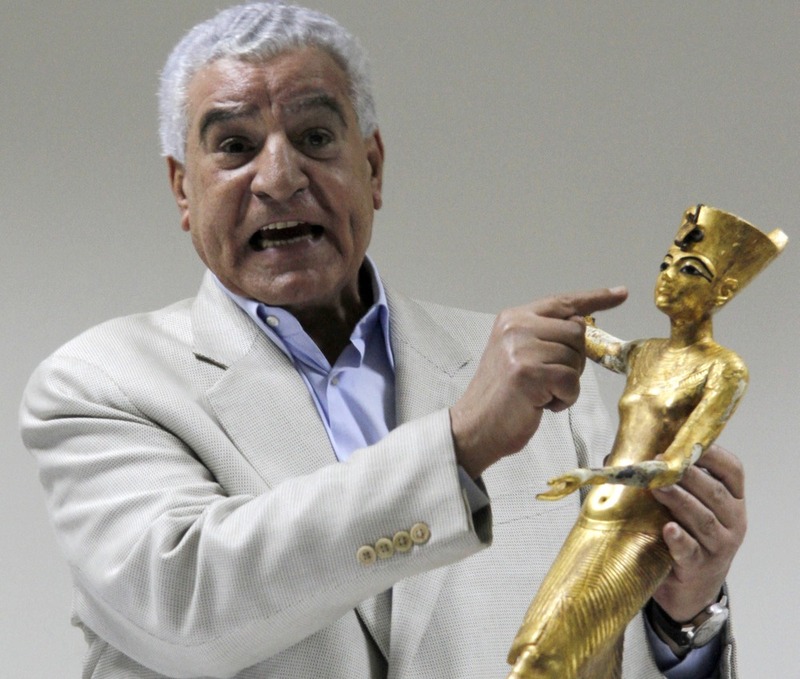 Hawass, a former minister of Egyptian antiquities, who was ousted due to accusations of corruption and illegally selling antiquities in 2011, has vehemently been saying since day one that there are no hidden chambers, and that Nefertiti will not be found behind the walls, because he already found her mummy several years ago, which was aired on a TV show, one of many he has hosted for the History Channel, National Geographic and others. He points to DNA testing to confirm the legitimacy of his discovery. Seasoned Egyptologists will readily admit that DNA testing on any mummy is inconclusive. The pharaohs and queens all inter-married within the royal family to protect sovereign blood lines, so any mummy found within a cache or “family” of mummies, would have similar DNA, rendering positive identification almost impossible. Royal mummies were often moved from their initial burial site, sometimes put in used coffins, stripped of identification (and jewels), as was the case with the unknown mummy Hawass claims is his Nefertiti. In Egypt, as everywhere else in the world, DNA analysis is not a perfect science. 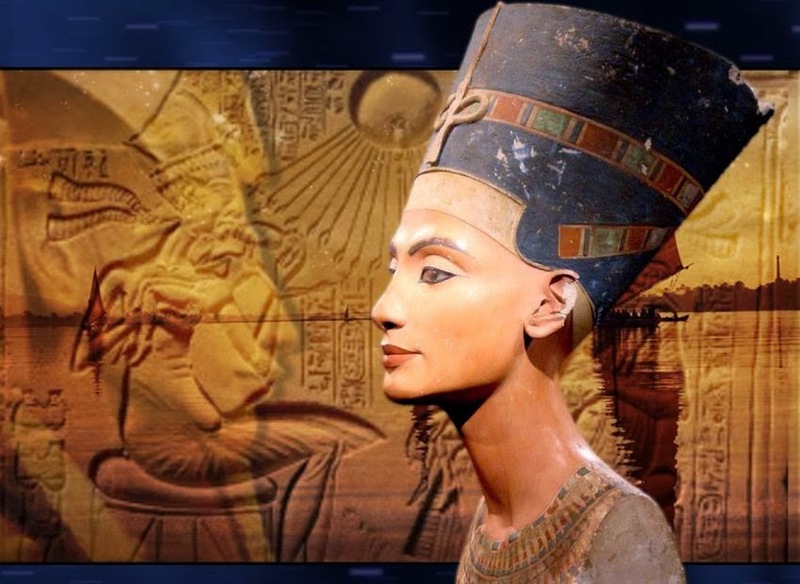 Consequently, many questioned Hawass’ stance that he had actually found the real Nefertiti. But to challenge him, while he was still minister, was considered professional suicide. Many authored Egyptologists, often allude in their books to Hawass dismissing their initial findings, sometimes even shutting down their digs or denying them further access, only to come back at a later time, when everyone is gone, and take credit for their discovery. Access to ancient sites, meant pandering to Hawass. Is it any wonder the man has made plenty of enemies over the years, resulting in his swift ouster during the 2011 Arab Spring uprising and regime change. Many Egyptologists say that while Hawass has done much to preserve ancient history during his reign as antiquities minister, he also did much to suppress important findings. After his fall from professional grace, Hawass vowed to make a comeback. Towards this end, insiders currently believe he has been working behind the scenes to sow seeds of doubt and dissension between all parties, including the current minister of antiquities Khaled El-Enany, and the recently replaced minster, Mamdouh Eldamaty, who declared he was “90 percent” certain that such hidden chambers exist. Hawass may have been ousted from direct power, but he still seems to think he wields a mighty sword of influence behind the scenes. He may be right. No one is sure why National Geographic abruptly pulled the plug, claiming nothing is there, when others have found evidence to the contrary, but insiders allege that Hawass might somehow be behind it. Hawass’ relationship with the National Geographic Society goes way back. In fact, it was because of some of the contracts he illegally made with National Geographic, without required Egyptian government authorization, which contributed to him being accused of corruption charges for personal profit. Insiders theorize that Hawass may, once again, have his own agenda and timeline for this potential new discovery. Debate continues to rage, as witnessed at this past weekend’s Second Annual Tutankhamun Grand Egyptian Museum Conference in Cairo. Over a hundred people watched the two former government ministers, Hawass and Eldamaty, sit onstage and angrily accuse each other of trying to drill holes into World Heritage Sites without proper permission. The quarter-size hole needed in Tut’s tomb to put speculation to rest, would be drilled near the floor of the unpainted North wall (believed to be a false wall), and a small fiber optics camera would be inserted. No one is threatening to drill without permission. Permission to do so is what this entire drama is all about. They drilled holes even bigger in the hidden door found in the shaft of the King’s Chamber in the Great Pyramid during Hawass’ time. So this is really a power struggle between ego and politics. Right now there are two different radar scans showing contradictory evidence. In Reeves’s theory, these doorways present several clues suggesting that the tomb was originally built for another ruler—Nefertiti, the principal wife of Akhenaten. It is not certain whether she is the biological mother of Tutankhamen, or if he is a stepson by another of Akhenaten’s wives. But if she is buried in the hidden chamber next to him, it would certainly support a maternal theory. Nefertiti died suddenly in year three of Tutankhamun’s reign (1331 BC) and apparently vanished without a trace. When Tutankhamun himself died shortly into his rulership, at age 19, in all likelihood he was hurriedly buried in someone else’s finished tomb—someone with rank who had a tomb befitting a king. 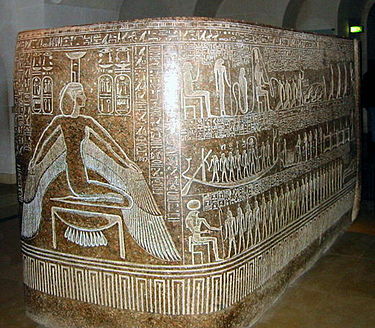 Tut’s current tomb is considered quite small, the size of a royal’s antechamber, not a full tomb. This is considered quite unusual for a king, even for one that had an uneventful and short reign. This would lead to the theory that it might be a partitioned double tomb. Perhaps, Om Sety was correct in saying that Nefertiti was buried close to Tutankhamun” where nobody would think to look,” (at least for centuries, that is). I’m sure before long, we will all know the truth about Nefertiti’s final resting place. That should be the treasure of all treasures.